Famous for its shops, street performers, bars, restaurants, theatres and the Royal Opera House. Covent Garden in London's West End is a popular destination for visitors and Londoners who enjoy shopping, theatre, restaurants, bars, history and culture. Geographically, Covent Garden is located in Central London, bordered by the City of London and Leicester Square. It is within walking distance of Soho, the river Thames and Trafalgar Square. Famous for its shops, street performers, bars, restaurants, theatres and the Royal Opera House. 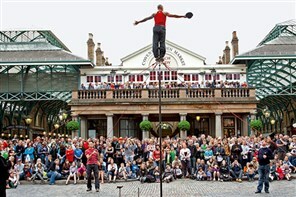 Covent Garden is an Italian-style piazza packed with restaurants, bars and fashionable boutiques. There are several smaller areas within Covent Garden that are worth exploring such as the traffic-free Covent Garden market piazza, The Opera Quarter, St Martin's Courtyard, Seven Dials, Neal's Yard, and Floral Street.